Miroslav Lajcák, President of the seventy-second session of the General Assembly, addresses journalists during an end-of-year press conference, and gives a preview of what is slated for 2018. 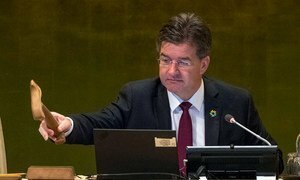 Safe migration, conflict prevention, sustainable development and United Nations reform will be the priorities of the 72nd UN General Assembly over the coming year, the 193-member body’s President, Miroslav Lajcak, said on Wednesday. “We will continue our work on the Global Compact for safe, orderly and regular migration," Mr. Lajčák told a press conference at UN Headquarters, welcoming constructive debates and a positive atmosphere during the consultation and preparatory phases on the initiative. Meanwhile, Mr. Lajčák said that on 24 and 25 April 2018, he would convene a high-level meeting on peacebuilding. “This will be a good opportunity to focus on the UN's work on sustainable peace and conflict prevention,” he noted. The United Nations General Assembly wrapped up its 72nd annual general debate today, with its President underscoring prevention of conflicts before they break out, support for UN peacekeeping, sustainable development, and respect for human rights and gender equality among the major priorities raised by the 196 Heads of State, Government and delegations.